I set out looking for a quilt guild a few months ago. Of course, I had no idea what you even do when you're part of one, but the idea intrigued me and I knew it was a lot of other people who like to play with fabric. There can't be anything wrong with that. As luck would have it, a guild had just started that was meeting about 20 minutes from me. I still consider myself an amateur quilter, but a full-fledged fan, so I was hoping I wouldn't be out of my depth. Turns out, this group will welcome you with open arms, even if you don't know all the quilting lingo. It's a highlight of my month. 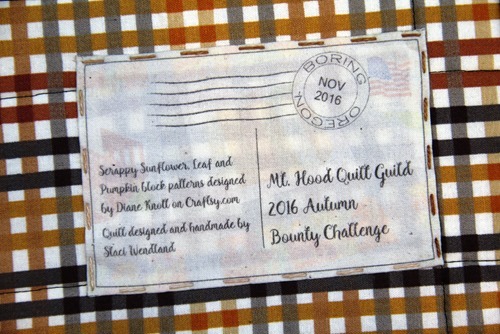 Recently, one of our members organized a fun event called the Autumn Bounty Challenge. I'll be honest, this fabric wasn't something I would have picked if I were out shopping. At first I was at a loss as to what I should do with it. But I couldn't bail on my first ever quilt guild challenge, so I hit the books to find something that would make me happy when it was finished while still keeping the integrity of the fabric. 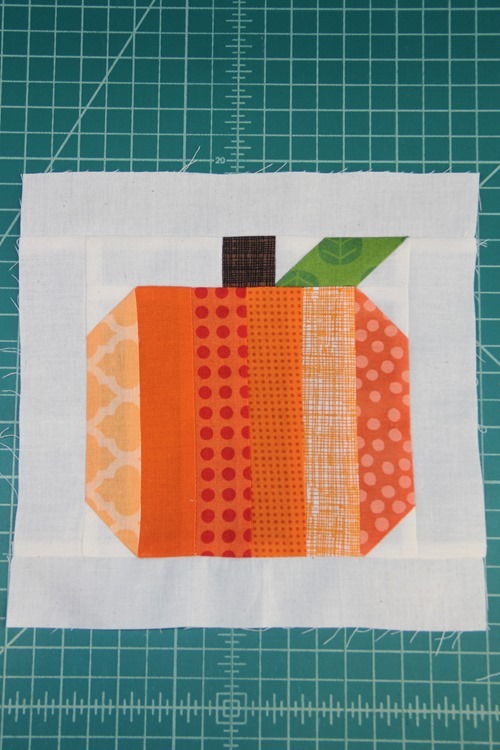 I ended up finding three blocks on Craftsy by Diane Knott that I loved. Because they're all pieced and small, I didn't even have to buy any fabric. The first one that caught my eye was the pumpkin. The next was the scrappy sunflower. 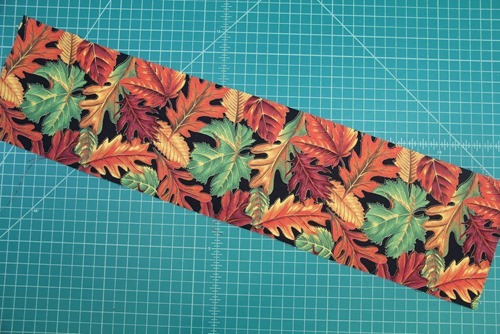 And of course, I had to include the leaf to tie in to the fabric print. Did I mention that all three of these patterns are free? These were each 8 1/2" square when they were finished, but I cut them down to 8" to better fit with the leaf print. I cut it into six 3 by 8" pieces. 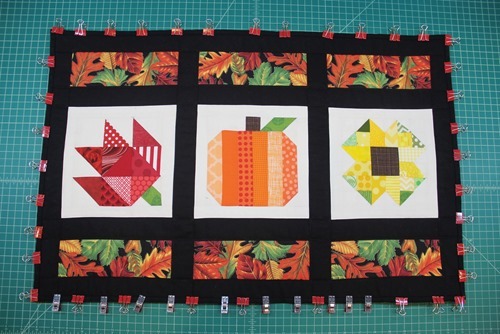 I decided to go with the black background in the challenge fabric and add black between each piece. That worked out well, since I end up with LOTS of black strips of fabric left over from my vendor aprons! …and around the outside. Top finished! And there it sat for a while. It's a little intimidating to think about quilting something that other, more experienced quilters are going to examine. I finally decided to bite the bullet and just do it. I pinned the heck out of that thing though. I thought about quilting it by hand, but in the end did it on the machine. I'll save that monumental attempt for another project. I went through the same thought process over the binding. In the end, it felt more important to have it finished. Again, I went crazy holding it all together while I sewed. Surprisingly, after all that the biggest sticking point of this whole project was the label. I've made a couple of quilt labels in the past, but I don't think one has ever made it all the way to becoming attached to the quilt it was intended for. The tiniest thing gave me the biggest headache. What should I put on it? What should it look like? Should I embroider it? Print it? Handwrite it? Ugh. I finally decided to make it look like a postcard and print it from the computer. I LOVE it! It was really fun to work with something I didn't choose, and I found I really welcomed being forced to think outside my usual little bubble. It caused me to find a method to use something in a different way, and not cast it aside because it wasn't my style. The challenge was completed at last night's meeting, so now I can't wait to start using this on my table. I'm looking forward to seeing what the next challenge is going to be!